Dandruff (Pityriasis capitis) is the excessive flaking of dead skin that forms on the scalp. As it is normal for skin cells to die and flake off, a small amount of flaking is normal and in fact quite common. Some people, however, either chronically or as a result of certain triggers, experience an unusually large amount of flaking, which can be not only a visual nuisance, but is also often accompanied by redness and irritation. Most cases of dandruff can be treated with specialized shampoos or common household remedies. 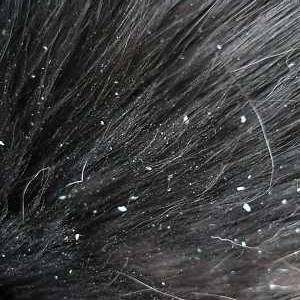 Dandruff can also be a symptom of seborrheic dermatitis, psoriasis, fungal infection or head lice. Excessive scratching should be avoided. Scratching to the point of causing breaks in the skin can increase the risk for infections, particularly from staph and strep bacteria. As skin grows, epidermal cells are pushed outward where they eventually die and flake off the body. In most people, these flakes of skin are too small to be visible. However, certain conditions cause cell turnover to be unusually rapid, especially common in the scalp. In people with dandruff, skin cells may die and be replaced about once every two weeks, as opposed to around once a month in healthy people. The result is that dead skin cells are shed in large clumps, which appear as small, unsightly white or grayish patches on the scalp. Dandruff is understood to be the result of a combination of factors. Some of these factors are well studied, whereas others have not been thoroughly investigated. There is a common misconception that dandruff is caused by a dry scalp, or the drying effect of excessive shampooing. In fact, the opposite is true: people with oily scalps tend to suffer most from dandruff. Mild dandruff may be caused by overactive sebaceous glands. Other causative factors include family history, food allergies, excessive perspiration, use of alkaline soaps, yeast infections, and stress. Even the season of the year can contribute to the problem: Cold, dry winters are notorious for bringing on dandruff or making it worse. Symptoms of dandruff can also be aggravated by exposure to dust, UV light, harsh shampoos, and hair dyes. Dandruff is sometimes the symptom of seborrheic dermatitis. Seasonal changes, stress, and certain diseases seem to affect seborrheic dermatitis. The cold, dry air of fall and winter often triggers a flare-up. Emotional stress can worsen the condition as well. Dandruff can in some cases be linked to poor nutrition, particularly deficiencies in the mineral zinc. The appearance of flakes can be reduced, especially in those who suffer from only a mild case of dandruff, by proper hair care. Some people mistakenly avoid washing their hair, believing that the drying effect of shampoo will worsen their dandruff. By washing the hair regularly, however, dead skin is in fact removed before it can build up into larger, more noticeable flakes. Using acid-based shampoos helps restore acidity to the scalp, breaking down oils and preventing dead skin cells from collecting into visible clumps. However, shampoos with milder medication, or shampoos that are not marked to treat seborrheic dermatitis, may have little to no effect on redness and irritation. There are shampoo brands available specifically for those who have dandruff. The gold standard of treatment is a tar shampoo that contains salicylic acid. Other less effective products are Head & Shoulders, which contains zinc pyrithione, Selsun Blue which contains selenium sulfide, Neutrogena, T/Gel, which contains coal tar; and various generic products with the same active ingredients. For more persistent or severe dandruff, as well as dandruff due to seborrheic dermatitis, shampoo containing 1% or 2% ketoconazole, such as Nizoral, can be used. These anti-dandruff ingredients are either fungicides, which kill the Malassezia furfur fungus, or acids which break down the oils on the scalp that lead to visible clumping of dead skin flakes. Household remedies to get rid of dandruff are apple cider vinegar, salt or lemon juice. Severe forms of dandruff, particularly if accompanied by flaking or scaling on other parts of the body, should be treated by a dermatologist. Dandruff can occur in conjuction with skin conditions such as seborrheic dermatitis and psoriasis. Dandruff varies from person to person. It may be necessary to try various shampoos with different active ingredients (selenium sulfide, tar, salicylic acid, zinc pyrithione, ketoconazole) to find the best suited for any one individual. Furthermore, tea tree oil's antifungal activity has been found useful in the treatment of dandruff.